This gravy is full of savoriness owing to its ingredients: meaty bone broth, tomato paste, dried and fresh mushrooms, and fish sauce. (Yes, fish sauce. Don’t worry—the gravy isn’t fishy in the slightest.) 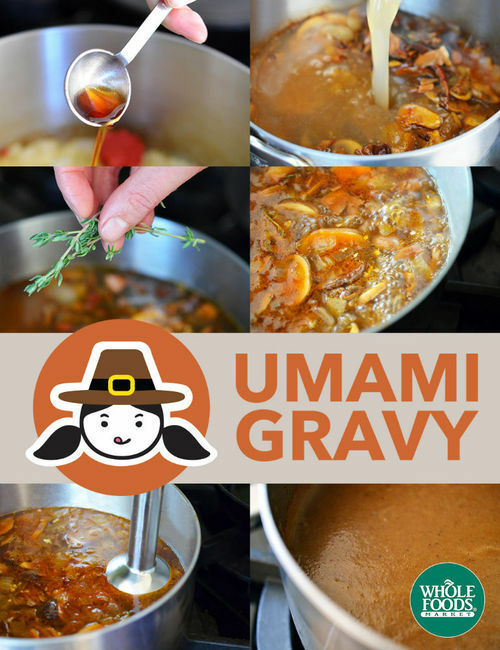 You can prepare the gravy ahead of time, and refrigerate or freeze it. Reheat it on Thanksgiving Day, and ladle this umami-packed sauce on EVERYTHING. And stay tuned! I’ve got yet another Turkey Day prep video to share with you—along with a countdown post that’ll help you with your Nomtastic Paleo Thanksgiving planning. Thanksgiving dinner’s gonna be a breeze this year!